Just got done Crisis Suit that will be the staple for the ones to come. Nice job, my paint jobs look like they&#39;ve gone through the digestive system of a tiger. 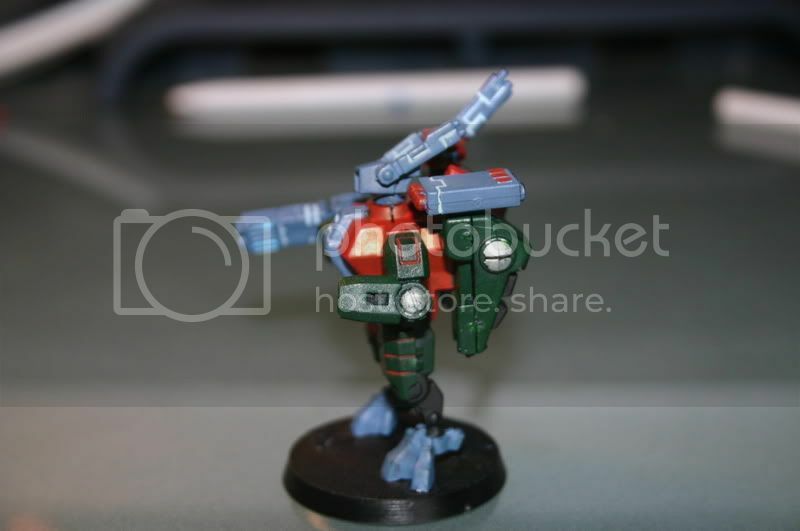 I despise the static pose of the model, battlesuits look much better if you pose them so the&#39;re flying or running. 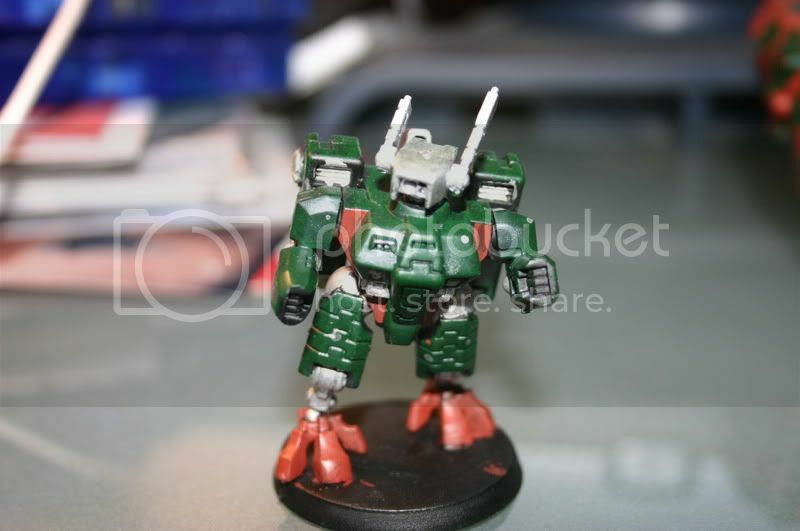 Also, pesonally i think you should continue the dark green on the main body, leaving the red only in the cracks. The red, could need one or two layers more. When painting red, start with a base coat of scabred/gorered and chaos black in a 80/20 ratio and add more red the more layers you go. This will end up with a red that isn&#39;t to [glow=red,2,300]RED[/glow]and a bit nicer to the eye, and covers better with the black in it. 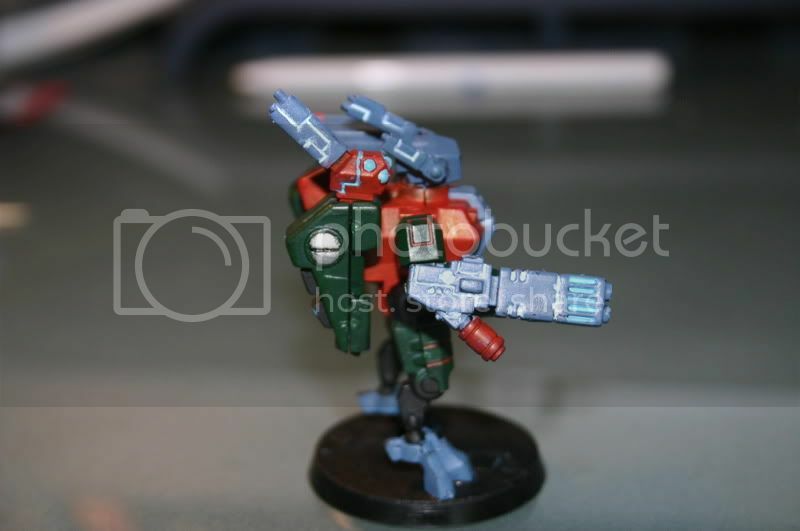 Your painting skills can&#39;t be questioned, I mean thats a good, neat model. The pose leaves a little to be desired, as does your choice of colours and there&#39;s an obvious lack of basing, which I&#39;m assuming isn&#39;t neglected but yet to come. I like the red and the blue. They go well together. The dark green...I am not too sure. Try to keep a dual colour scheme: 1 dark, 1 light. 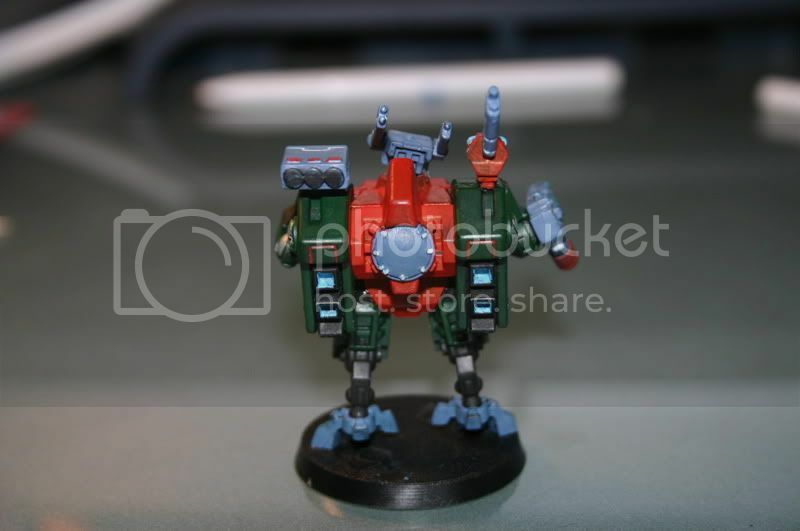 Also if you want to keep the green, I would highlight it: just run a thin layer of light green on the edges of the models only. This will give depth to the backpack. Same thing with the black. Black is a terrible colour because it completely absorbs light and for example, you cant tell that the suit has "fingers". The solution: highlights. With black: use basic codex grey. Again paint a thin line over the edges of the black. Dont make the highlights too thick though or you&#39;ll risk ruining the model. Dont worry about the static pose. Sure it is nice to have very active suits, but it can be hard to model. Also Active suits are a pain in the bottom to fit in a carry case. Also remember that you are either painting models at tabletop gaming standard or display standards. Sure it is nice to have well painted models, but it is better to play with a fully painted army (even if they are not that great looking in a close up). When you are playing you and your opponent are looking at models from at least an arm&#39;s length. people keep saying wash this, 80/20 that. its all a bit confusing. can anyone explain it to me, please? 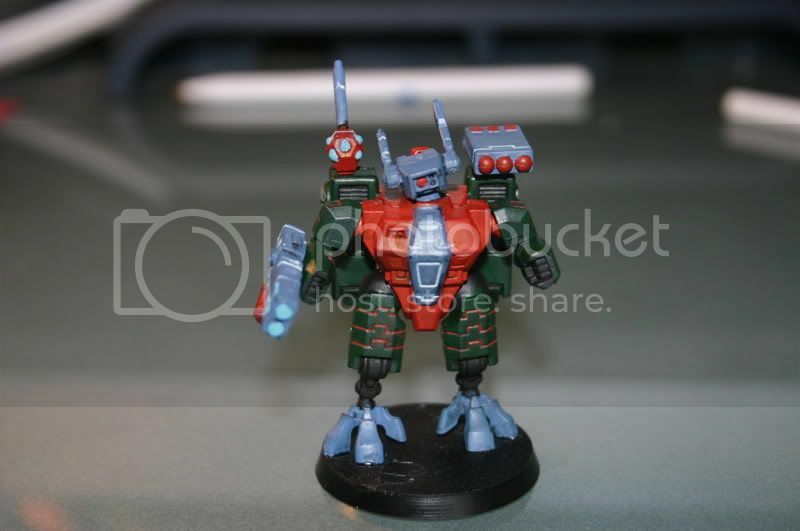 this was my very first Crisis Suit Job. and here is the very second one I&#39;ve ever done. I&#39;d say there&#39;s a vast improvement.